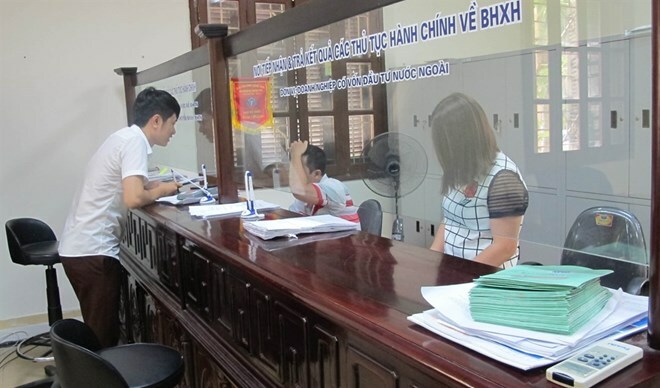 Hanoi (VNS/VNA) - The Vietnam Social Security (VSS) aims to slash the social insurance debt ratio to below 1.7 percent this year in an effort to ensure benefits for social insurance and health insurance card holders, said VSS Deputy Director General Dao Viet Anh. According to the VSS, social insurance debt premiums nationwide have amounted to more than 6.6 trillion VND (280.9 million USD), increasing by 1.3 trillion VND (55 million USD) compared to the end of last year. The debt ratio accounts 2.7 percent of the full-year collection plan. Social insurance debt has been reported to increase in all provinces and cities in all economic sectors, especially at private, joint stock, partnership and joint venture enterprises. The VSS named and shamed enterprises that owe debts amounting to billions of VND. LILAMA 3 Joint Stock Company in Hanoi’s Me Linh district owed 32.2 billion VND (1.37 million USD). Nam Phuong Limited Company in HCM City’s Cu Chi district has not paid 28.9 billion VND (1.22 million USD). Sai Gon Postel Corp in HCM City’s district 1 owed 27.9 billion VND (1.18 million USD). Mai Duc Thang, deputy head of the VSS Collection Department, said at a regular VSS briefing on March 26 that long overdue payments are due to a lack of regulations on debt management and settlement. The VSS and the Ministry of Labour, Invalids and Social Affairs have been working on the issue but have not reached an agreement. A number of enterprises spend payments on Tet (Lunar New Year) bonus, leading to the social insurance debt payment delay, he said. Thang said grassroots trade unions try to advocate for the enterprises to pay their debts and ensure benefits for labourers, but their influence remains limited. To reach the whole year debt reduction target, the VSS plans to cut the debt ratio from the first months of the year. The VSS will conduct unscheduled inspections of debt-owing units. If units that owe debts for more than three months have not been inspected, warning will be issued through the national database. Results of the inspections must be reported to police, labour unions and other related authorities for further punishments. The VSS plans to take stronger actions against overdue social insurance payments by publicising a list of debt-owing enterprises on the mass media. The enterprises that have been penalised but still delay payment will be reported to the police to start criminal proceedings.